Sometimes ya need a friend’s pick up truck and sometimes ya don’t! This one is borderline. Like, maybe a truck would have been overkill unless there are 42 cases of ceramic tile or 20 buckets of drywall mud on the inside of that car. OR… maybe the driver only uses fresh herbs and spices out of their garden, only uses fresh rain water (caught in a barrel) for laundry and cooking and wears all-natural fiber clothes. But THIS.. would be taking the organic theme a little too far me thinks. I was always good at those spacial awareness tests. So I look at the how much #$(!&$ that I have stuffed into my car, I look at the car in the pic and the 2×4’s, 1×3’s, 6mm #5 pieces of natural pine wood (yeah.. you’re right! I know ZERO when it comes to construction stuff!) and I think… you couldn’t get that in the back and run those things up through the middle or along the side? You HAD to tie them on the outside like a fire truck ladder? Are ya an emergency 2×4, 1×3, whatever…drop off vehicle for Do-it-Yourselfers who counted wrong and are now holding up a huge piece of drywall with one hand waiting for the emergency stud drop? 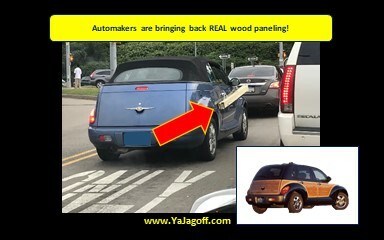 Wait.. maybe the owner is just TESTING to see if a wood paneling upgrade would actually look good on their car and they knew that duct tape would be a bad attachment method! That, on the other hand is brilliant… YaJagoff!! !